If there’s one thing that you’ll be acutely aware of if you’re running your own company, or leading a large team, it’s that time is valuable. We have the bustle of the working day within which to build our businesses, and then (formally or otherwise) time to allocate to family, leisure and travel. This post is about how a tweak in your routine can open you up to a world boundless learning/ entertainment by making use of those times in the day when otherwise there might be nothing. No doubt that part of the reason you’ve arrived in your position of seniority is through taking initiative to learn more about the world, and apply those insights within the context of your work environment. For the majority of time the primary medium for this has been reading. And that doesn’t even cover the difficulty of sourcing reliable, interesting, and diverse information, and avoiding all of the seductively written clickbait headlines that appear whenever we try to read something on the internet. Reading usually comes at the expense of all other tasks, namely you have to be stationary and submit full authority to your hands. The result is that this time when you have the opportunity to learn/ be entertained, but have to be mobile and/or put your arms to other use (mainly commuting or it could be, say, cooking), there’s a missed opportunity to learn about the world. For us curious types, this means our insatiable appetite to understand the world encroaches into our time that could be used for growing our businesses. The wonderful thing about the human brain is that it’s able to not just learn through words on a page screen but through what we hear. Since the advent of the radio, people have utilised audio transmissions as a means to learn/ entertain when books and newspapers weren’t as appropriate. The downside with the radio though is that the content can be a bit hit and miss, and that it’s not always “on demand”: for people in executive positions there’s value in selecting what you want, when you want it. 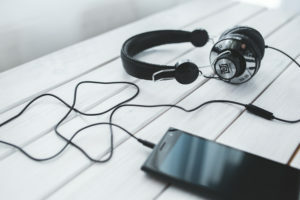 A podcast (a portmanteau for iPod and broadcast) is essentially a radio programme that you can download to listen to at your leisure at any time, typically through a smartphone. The barriers to entry are much lower than that of a producing a full-scale radio production, and so the supply of available content is almost unimaginably diverse. People or organisations who are experts on niche topics can share their learnings with the world, and artists can broadcast their latest output to anyone willing to listen. Naturally this means that some of the content can (in some people’s opinion) be sub-par, however as with every new medium, you have the joy of discovery, plus relying on those opinions you trust to guide you through the noise. Up to now we’ve spoken at a relatively conceptual level that a podcast is a radio show you can download and listen to at your leisure. In the same way that to access the content produced on the radio, you need to… well, buy a radio, there are some steps necessary to get yourself set up and with access to the world of podcasts. These days, the primary means to listen to podcasts is through your smartphone. For Android users there are a number of apps that offer relatively similar functionality. Podcast Addict and Stitcher are two of the most popular. Some have paid functionality, most are free to download. Within your podcast app you can begin searching for podcasts that you’d like to listen to. When a podcast episode is published by a producer it gets sent out into the internet, and automatically gets picked up by all of these podcast apps. Therefore if you’ve decided that you want to Subscribe to Podcast X, then whenever the author releases a new episode, it’ll appear in your app. Because the way to access episodes is through an internet connection, you will need to be online to stream and access new episodes. A bit like the app store, it’s possible to browse through podcasts and read descriptions when offline. The main benefit with podcasts, for us at least, is listening to episodes when you’re away from an internet connection. The simple thing to do is to find, say, 8-10 episodes at a time that at some point you know you’ll want to listen to, and then download them. This will give you access to listen to them anywhere. The simplest way to listen is to plug in your headphones, or play the episode through your phone’s speaker. For those people who drive to work, it will be probably be possible to connect to your smartphone to your car’s Bluetooth speakers and enjoy them that way. Podcasts are completely free to listen to! We can detect the sceptical business head of yours twitching. The majority of organisations treat podcasts as lead generation for their business, or have sponsors who bring in revenue for them and so it is plausible you will hear things like “This podcast is brought to you by…” at some point during most episodes. Either way, there’s zero outlay in enjoying all of the content. Which podcasts to get started with?! Now, with all of this talk of the benefits of delving into the world of podcasts it’s about time we started going through some of the content which you might enjoy. The East Africa Business Podcast: interviews with diverse range of entrepreneurs building businesses in an emerging market. The Inquiry: expert opinions on pressing questions in today’s society. Desert Island Discs: treasure trove of life stories from renowned people in the last 75 years. The Guardian Long Read: audio version of the newspaper’s esoteric articles. Serial (Series 1): murder mystery (of sorts). Gripping. At Inspira we care about making sure that you make the most of your time when running your business. Despite this post being focused on how you might think about your time outside of the 9-5 7-7 we hope this opens you up to further possibilities to learn about the world which, no doubt, you’re also interested in.